LOS ANGELES, California – It is time to deal with Hollywood producers who misappropriate biblical names to deceive believers in God to trust that their movies portray an event detailed in the Bible in order to make a profit. What's more, this film tends to re-wire the thinking of followers regarding God and Jesus, birthing skepticism where before there was faith. This is not uncommon amongst Jewish atheist profiteers. 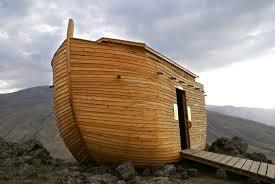 To do so as in the movie, Noah, is a shameful action that calls for strict condemnation. It is even more disturbing that Christians along with Jewish believers in the God of The Old Testament actually endorse this blasphemous portrayal of a man of God. The movie celebrates the occult, with Methuselah, Noah's father, worshiping a pagan god and giving him a brew to drink that gave him the 'vision.' The word God is not mentioned, but the substitute name, Creator, is mentioned 26 times. Frankly, this movie is anti-God and anti-Christian. TAKE NOTE CHRISTIANS – THE DIRECTOR OF THIS FILM IS AN AVID ATHEIST – WHAT DO YOU EXPECT TO BE PORTRAYED ABOUT CHRIST BY AN AVOWED ATHEIST? RESPECT YOUR HARD-EARNED MONEY DON'T GO! The new movie "Noah" hit the screens Friday, March 28th. I thought you could use a few facts to help you determine if you should go see this film that is claiming to be "inspired by the Biblical story." Hopefully these facts, of which you may not be aware, will make you think twice before you give your money over to Paramount Pictures and the director of the movie, Darren Aronofsky. Darren Aronofsky, the director of the film, is a "card carrying atheist" and open about it. At the opening of the Noah Movie in Mexico, Darren Aronofsky said: "It's a very, very different movie. Anything you're expecting, you're f – ing wrong." Aronofsky also said: "I'm Godless. And so I've had to make my God, and my God is narrative filmmaking, which is – ultimately what my God becomes." Aronofsky is not interested in the Biblical record, fossil record, or hundreds of cultural records that testify to the Flood being a true event. He summed up his view of the Biblical account like this: "I don't think it's a very religious story, I think it's a great fable that's part of so many different religions and spiritual practices. I just think it's a great story that's never been on film." Paramount Pictures is the funder for this movie. They also produced the Wolf of Wall Street which used the F word more than 500 times at an average of one every 21 seconds and blasphemed the name of God almost two dozen times. Reason #1 in the article, "5 Reasons Why Atheists Should Look Forward To Noah" is that "Darren Aronofsky is God." The article concludes, "So get out there, enjoy the film and lap it up like the deity that you've always wanted to be!" Critics are not so thrilled about the project saying, "Some have been bowled over by his epic take on the story of the ark, while most others find his movie messy and ill-conceived, with the result not quite coming together." While these seven reasons don't begin to cover the totally un-Biblical approach taken on this Historical Account, they are enough for me to say, "No, Thank You!" Hollywood only hears $$$$, so if you don't give it to them, they WILL listen! And, you have to wonder, is this atheist just seeing if he can make fun of the Bible and get Christians to pay for it?